1. 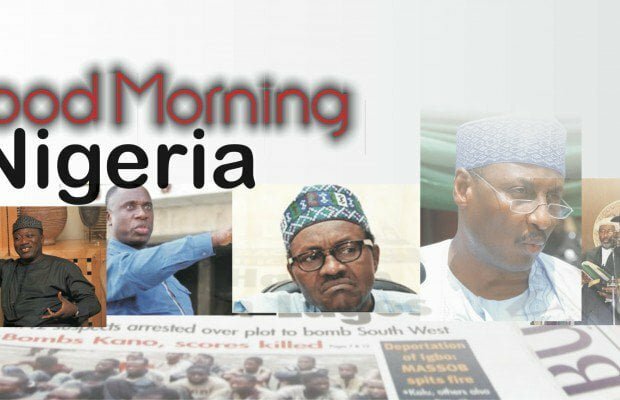 The United States has reacted to the recent clashes between the Nigerian security agencies and members of the Islamic Movement in Nigeria, IMN, also known as Shittes. The US Government expressed concern over the rate of killings caused by the crisis, while calling on the President Muhammadu Buhari government to conduct a thorough investigation into the incident and take appropriate action. 2. The Federal Government on Thursday said it was doing its best to ensure the safe release of Leah Sharibu, one of the kidnapped Dapchi school girls who is still held captive by the Boko Haram insurgents. Minister of Information, Lai Mohammed, told newsmen after the Centenary anniversary thanksgiving Mass, that Leah was dear to the government and it would do everything possible to rescue her. 3. Gunmen have kidnapped a Naval personnel, simply identified as Kola, along the Sapele/Benin road in Delta State, demanding a N4 million-ransom from the families of the officer. The officer was returning from a course in Sapele when the gunmen attacked and whisked him to the forest. 4. The Nigeria Police Fore has rejected the Amnesty Internationalâ€™s report on the use of force against members of the Islamic Movement of Nigeria (IMN) also known as shiâ€™ites. The organisation in its report on Wednesday stated that the police and the military used deadly force against IMN members. But the force spokesman, Acting DCP Jimoh Moshood, noted that the allegation against the police was false and misleading. 5. The National Chairman of the Action Peoples Party, APP, Imo Ugochinyere, has dragged President Muhammadu Buhari to court. Ugochinyere, in a suit he filed at the Federal High Court in Abuja, is seeking to stop President Buhari from contesting the 2019 presidential election over his inability to present his Oâ€™level result to the electoral body. 6. The Defence Headquarters has responded to Amnesty International (AI) report in which the group alleged that the Nigerian military and the police engaged in horrific use of excessive force that led to the killing of members of the Islamic Movement in Nigeria (IMN), popularly known as Shiâ€™ites. Brigadier General John Agim, Acting Director Defence Information, in a statement on Thursday accused AI of consistently fabricating lies and giving negative narrative of issues related to Nigeriaâ€™s national security and its military. 7. A fourth video has surfaced online showing the Kano State Governor, Abdullahi Ganduje, allegedly receiving wards of dollar bills believed to be bribe. 8. Unknown gunmen on Thursday abducted three officials of the Nasarawa State Primary Health Care Development Agency (NSPHCDA) along the Nasarawa-Toto Road, Nasarawa State. The State Public Relations Officer of the Police Command, Mr. Kennedy Idrisu, said the three officials were traveling in a white Toyota Hilux van when the gunmen pounced on them at Bugan-Gwari village, at about noon. 9. The National Emergency Management Agency (NEMA) and the Nigeria Geological Survey Agency (NGSA) have confirmed an incident of earth tremor at the Maitama District of the Federal Capital Territory on Thursday. 10. Governor Rochas Okorocha of Imo State has reacted to reports of his plans to defect from the All Progressives Congress (APC) over the fallout of the partyâ€™s governorship primaries in the state. Okorocha, who spoke with State House correspondents after a closed door meeting with President Muhammadu Buhari on Thursday at the Presidential Villa, Abuja, vowed not to abandon the house he built for anybody.